10 years after their initial formation, Manchurian quartet Everything Everything are still finding new ways to innovate and inspire with their quirky, vibrant take on indie-pop. It’s landed them countless slots at music festivals, internationally-charting albums and some instantly-recognisable tracks — which, quite naturally, continues into album number four. Entitled A Fever Dream, the British band’s lofty ambitions are amazingly realised yet again, from dark synth-driven rock to fluttering guitar pop and back again. The band are set to return to Australia at the end of the year as a part of Falls Festival up and down the east coast. Ahead of that, we spoke with Jonathan Higgs — the band’s singer, lyricist and rhythm guitarist — to talk club bangers, conspiracy theories and their “heavier” new record. Music Feeds: A Fever Dream arrives two years after Get to Heaven — which, itself, came two years after Arc. That’s quite a consistent hit-rate at a time where some bands can take half a decade to follow up on a record. Are you generally working towards the next release while still touring in support of the record that’s current at the time? Jonathan Higgs: Usually, yeah. Actually, we tried to do it a little differently when we were writing Get to Heaven. We took some time off specifically just to write for the record — and, for whatever reason, it knocked us about a fair bit. We didn’t want to repeat that for this album, especially because we’d already done it. We stuck to writing while we were on the road this time around. It seemed to work really well. It kept our brains moving; it kept us motivated. We’d write every day — it was important that every day, we all wrote something each, no matter how big or small. It meant that we ended up with a lot of material, and a lot to work with by the time we got to the studio. Having too much is always a good problem when it comes to us. MF: What in particular was driving you to write and create away from simply the environmental context of being on the road? Even though there’s been minimal time between Get to Heaven and A Fever Dream, it feels like a lot has changed in that time. JH: Definitely. I think what we were listening to was a big part of this album. If we ever hear something that we find exciting, we try and find a way to emulate that energy or that element into our own music. That will always tend to guide the records we make, even as that morphs and changes with each one. We definitely had a lot of artists from Warp Records on the stereo — a lot of Aphex Twin and stuff like that. I was listening to a lot of French house music, as well as a lot of older hip-hop. I mean, you can’t really hear those things on the record directly or explicitly. We just ingest as much music as we can, and what you hear on the album is just how it came out the other end. MF: One would suppose that’s reflective of Everything Everything as a whole. Yours has always been a considerably diverse sound and stylistic approach. Do you ever feel as though the band has come close to having a sound, per se, or do you actively work against that? JH: Yeah, I don’t know. I just don’t think that we’ve ever had a particular sound, really. I don’t think we’ve ever really stuck to anything. I mean, my singing voice sounds a particular way, and that’s something we can never really escape from. In terms of everything else though, I feel like we’ve not really made any steadfast commitments. We just keep changing. There’s even stuff on the new record that we’ve never done before. You can tell that each of our records are us, but I don’t think you can specifically say why apart from the voice and maybe a couple of other things. Honestly, I like it that way. I wouldn’t ever want anyone to hear a new song of ours and say ‘that’s a classic Everything Everything track’. MF: That opens up the question of what exactly you did differently on A Fever Dream. What’s new to you here? JH: I think there’s a lot of heavier moments on this record. I’d say overall it’s a heavier record than we’ve ever done before. Look at a track like ‘Ivory Tower’, which has this massive instrumental riff section. I don’t think I would have ever written something like that in the past — not even close. ‘Desire’ too, has this rhythmic format that we would have never used previously. The title track is one of our danciest moments — I think what we came up with there is really impressive. When it comes to dance music, we’ve never really jumped into that world with both feet the way that we did on this record. We’ve never really written something where it feels like a song for the club, but it kind of hit us here that it could actually be a possibility. MF: When you were writing the record last year, you spoke publicly about how the effect of Brexit would inevitably work its way into the music itself. Now that A Fever Dream is finished, how much of the political climate impacted on its creation? JH: It didn’t. Well, it did and it didn’t. I discovered pretty quickly that things were going to move way too fast for me to ever keep up with it. I made the decision to have it as a backdrop of sorts rather than the main focus. It wasn’t that I didn’t want to talk about that sort of stuff — I mean, I talked about it a lot on Get to Heaven. A lot of what I was singing about on that record came true, though, and I think it was obvious that I didn’t want to repeat myself. Besides, everyone else is talking about it now. All the time. The world is so full of comment and opinion. People becoming outraged. Conflict. I didn’t want to add to it. That’s just another voice, getting lost in this wave of crap. I’d rather focus on the people on the ground. The human-to-human interaction. What these events do to society, rather than these events themselves. MF: That, in itself, could be interpreted as a political move. JH: That’s true — and that’s deliberate. I mean, it’s not that I didn’t want to say that it was happening — there are loads of references and allusions to it throughout. I wanted to treat it more like a story where a war is happening, but the war itself is never the central focus or referred to directly. I don’t need to talk about the war when everyone knows about it. This album is about being on the frontline. MF: That can also leave some very open interpretations. Have you either seen or read any decryption or dissertation of your lyrics that have ended up with the completely wrong end of the stick? JH: Yeah, it happens all the time. I like it. I encourage it. I put lots of stuff in the music where the lyrics can be read in more than one way. Often, the other way it can be interpreted is the exact opposite of what I actually think, but I really like that. I like the idea of maybe putting something out there that’s a little dark or a little sarcastic, and having someone out there that co-opts it for themselves that can’t find the irony. I’m really entertained by the notion of people misinterpreting my messages — for whatever reason, it really pleases me. There’s a lot of stuff in the lyrics of Get to Heaven that were about conspiracy, even though I don’t believe in any of them. I like the idea that someone might take me as some sort of conspiracy theorist purely on the basis of that. MF: So we’re ruling out any potential Alex Jones collaborations? JH: [laugh] I think we’re already hearing from him on this album, between you and me. That sort of stuff is just a part of our everyday lives now. This kind of world that I was writing about on Get to Heaven… we’re in that world now! It’s legit. It’s terrifying. I see more conspiracy in my day-to-day life now than ever before. It’s every other thing you read on Facebook. Everyone is doubting everyone else now. MF: Back to A Fever Dream. You’ve already started playing these songs live, even before the record came out. How has the transition been from the studio in the performance environment? JH: We’ve played about half of the songs from the record so far. The rest has been rehearsed, but not played live yet. Some of it is definitely the hardest stuff I’ve had to sing and to play live. I’ll get the hang of it pretty soon — and besides, if it was easy then I’d just get bored. Who wants to see a band that’s bored before they’ve even started properly touring? We’re still playing as a five-piece – that’s more or less essential to what we do now. We do have a few backing tracks here and there, but it’s important to us that the majority of the song’s elements are being performed live. When we’re playing live, I learned pretty quickly to put all of my focus on my singing. By concentrating on it, I became a lot better at it as a result. My mantra has basically become ‘get someone else to do it’ [laughs]. Everything Everything’s new album ‘A Fever Dream’ is out now. Read Music Feeds’ review of the album right here. 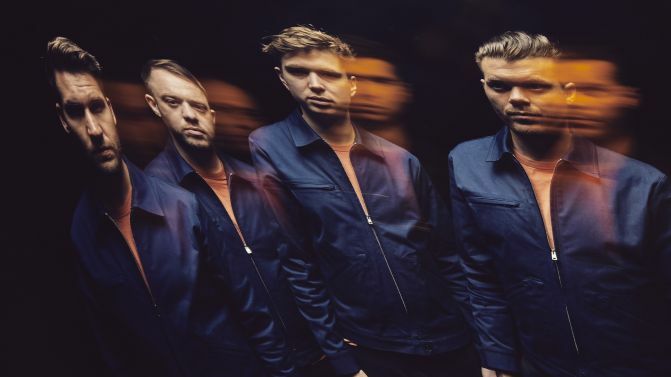 Everything Everything will perform at Falls Festival later this year.